The United States expectedly swept Pan Ams in September, with Oregon State commit Jade Carey and Utah commit Grace McCallum each picking up two individual titles. Florida freshman Trinity Thomas also had an outstanding meet, winning two silvers. On the international front, Frida Esparza, a Mexican national team member who will join the UCLA Bruins next fall, finished ninth in the all around with a 51.533 and contributed to Mexico’s team bronze. Jamaica’s Danusia Francis, a UCLA alumna, finished No. 12 and qualified Jamaica to next year’s Pan Am Games. Two NCAA commits competed at the Asian Games in late August. Corinne Bunagan, an Alabama commit, represented the Philippines and finished No. 12 in the all around with a score of 48.950. North Carolina’s Tienna Nguyen scored a 47.100 to finish No. 18 for Vietnam. While the U.S. women’s team for worlds hasn’t been announced yet, many other countries have already selected their teams, and the roster includes one current, three future and one past NCAA gymnast. Active Iowa State team member Ariana Orrego will represent Peru. 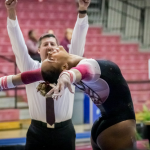 Esparza has taken the Mexican national team by storm in 2018 and will travel to Doha as one of the squad’s leaders while Bunagan is the next in a long tradition of US-trained NCAA gymnasts who competed for the Philippines. Nguyen has had success already representing Vietnam internationally and will compete again in Doha. Francis will be representing Jamaica while would-be teammate Toni-Ann Williams of Cal is on the nominative list but won’t compete due to an elbow injury. Meanwhile, Thomas and Carey have ruled themselves out of worlds selection for the United States. Carey and her father/coach stated their intent to target the Tokyo Olympics through individual qualification at event world cups. It’s unclear what this means for her NCAA career as many of her qualifying opportunities fall on NCAA meet weekends. British junior star and Cal commit Amelie Morgan is representing Great Britain at the 2018 Youth Olympics, and she’s a leading medal contender. 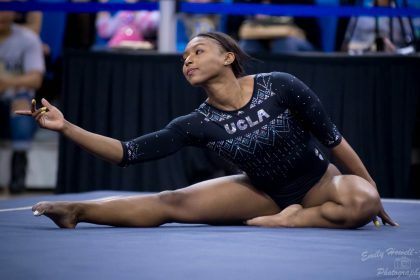 She’s currently the only committed gymnast in the women’s field, but three gymnasts who competed at YOG in 2014 are currently competing in NCAA, so we can hope for others to verbal later on. Five current and former NCAA gymnasts were chosen to represent the U.S. at the upcoming 2018 world championships at the conclusion of the world team selection camp on September 22. 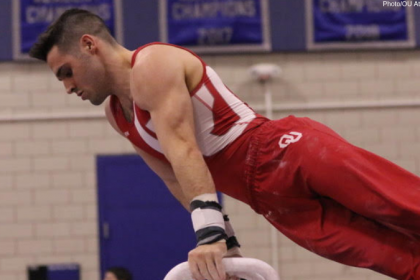 Oklahoma senior Yul Moldauer and former Sooner Colin Van Wicklen were named to the team alongside current Ohio State senior Alec Yoder, former Michigan gymnast Sam Mikulak and former Stanford gymnast Akash Modi. Former Sooner Allan Bower was also chosen as the traveling alternate for the team. To see full results from the world team selection camp click here, and to read more about the selection process click here. The U.S. men’s team, lead by a contingent of collegiate gymnasts, won the team gold medal at the 2018 Pan American Championships. 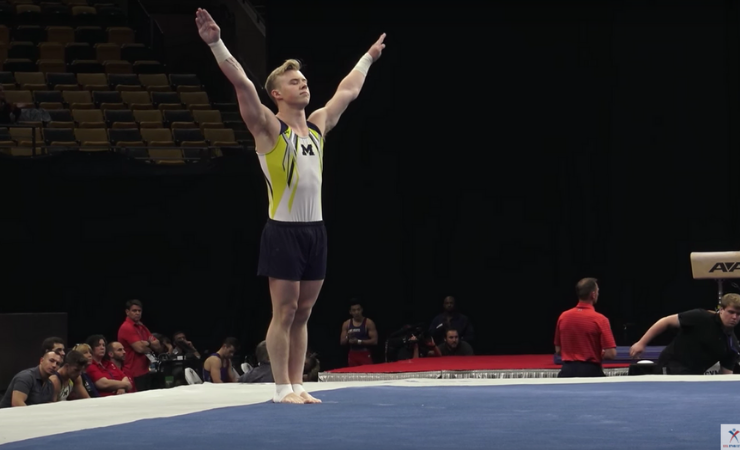 Michigan sophomore Cameron Bock won a silver medal on pommel horse, as well as bronze medals on floor exercise, pommel horse and in the all around. Genki Suzuki, an Oklahoma senior, won the pommel horse title. Also on the team were Spencer Goodell, a freshman at Oklahoma, and Kanji Oyama, a former Sooner. Sam Zakutney, a Penn State junior, and Darren Wong, a freshman at California, both represented Canada at these championships. Canada placed fifth in the team final while Zakutney placed 11th on parallel bars and 14th in the all around. Also representing Canada was former Iowa gymnast Cory Paterson, who placed fifth on high bar and finished 10th in all around qualifications (but did not place 10th in the final standings due to the two-per-country rule). Springfield College junior Stephen Lewis competed for Jamaica and placed 13th in the team competition. Individually, Lewis placed 15th on vault and 28th in the all around at the championships. UIC junior Asad Jooma represented Pakistan at the 2018 Asian Games held in Jakarta, Indonesia, in late August. Jooma placed 28th in the all around as well as 11th on vault, only a quarter of a tenth away from making the vault final. Several current and former NCAA athletes were named to final or nominative rosters to represent their countries at the 2018 World Championships this October. Gymnasts on their country’s confirmed roster are: former Iowa gymnast Cory Paterson for Canada, Penn State junior Sam Zakutney for Canada and California freshman Darren Wong as an alternate for Canada. Listed on their country’s nominative roster are: former Illinois gymnast Tyson Bull for Australia, former California gymnast Yordan Aleksandrov for Bulgaria and Springfield junior Stephen Lewis for Jamaica.